The alarm on my cell phone goes off as normal, but I’m already, reluctantly, awake. First of all, last night was so cold that I couldn’t sleep–even with two thick blankets and a husband to keep me warm. Secondly, Ilsa has just crawled in with me. She’s been coughing all night and now she is burning with fever. I tell her to stay put and get up to get the boys fed and off to school. It’s a normal day for almost everyone here in Morocco. Thanksgiving is an American holiday and as such has not translated to other places. Yesterday I bought two kilos of potiron and boiled it up. Today I am attempting to make evaporated milk out of powdered milk. Apparently, this is how it’s done. I have searched through all the suitcases and found my pastry blender but not my cookbooks. This kitchen has a blender but no hand mixer or pie pan. Hmmm. I will make pie in my springform cake pan, and we will have lumpy mashed potatoes, I decide. There’s no rolling pin either. I make pastry and put it to rest. Last night I left the pumpkin chunks in a colander and got a lot of the water out. This morning, I blend the pumpkin in the blender. I’m excited–this might be my best pumpkin pie from scratch. I’ve tried pies before but never managed to get the texture right. Ilsa coughs on the couch, but after lunch and Tylenol is recovered enough to make table decorations. Poor Ilsa. Thanksgiving dinner is one of her favorite meals. Elliot, on the other hand, dislikes turkey, mashed potatoes, pumpkin pie, and gravy. I feel for his future wife. The boys are having one of their complicated afternoons. Elliot has class from 2-5 but Abel from 3-4. Although the school is close, I’m not comfortable with letting Abel walk alone. He’d probably be fine, but we have heard some stories. So while the pie is (finally!) in the oven and the laundry is hung out to dry on this cold but not actually rainy day, I put on my shoes and walk him up. He has spent his 3-hour lunch making paper airplanes for Thanksgiving. I realize that’s not a traditional decoration, but how many paper turkeys does one really need? The pie comes out! Looks fine, although it burned a bit in spite of cooking in nearly half the time. Smells really good. The whole house is warmer from the oven. Morocco is as cold as Oregon, we’re finding, with one big difference: no indoor heating! We’re going to buy space heaters, but taxis don’t go to the store where they are substantially cheaper, so we’re going to wait till someone can take us. Send slippers, comforters, sweatshirts! A few minutes respite. The boys will be home soon. Our guests will come around six. Ilsa doesn’t look well; I wonder if she will make it to school tomorrow. (Our guests are just getting over this, so I’m not worried about them getting it. Me, on the other hand, I’m worried.) Things are starting to come out of the tiny oven, and they tend to be burned. This oven heats up to 500 degrees very quickly, which is a bit hotter than I need for dressing. I have a minute to sit down with a cup of tea before putting the turkey breasts into the oven. How will this work? I’m not sure, to be honest, but this is long enough so I’m going to post it. Updates later. We bought a cheap espresso machine in Spain and we have set it up. (brand name: Fagor.) We are a little disappointed with the coffee it makes, which is not horrible, just not great espresso, more like coffee. We think we may be able to solve this with a deeper filter and some better coffee. We are enjoying many of the food items we bought in Spain and Gibraltar. I have figured out how to use the washing machine, which won‘t spin unless you manually go and turn it to spin cycle. Because it took me quite a while to figure out the washing machine (which is also a Fagor. Coincidence? ), I hung out the clothes to dry quite late yesterday afternoon and then forgot about them. I remembered them, however, when I woke up about 4 a.m. to the merry sounds of heavy rain. Ilsa had to wear dirty socks today. We are settling in as well as we can, unpacking our junk and arranging it around the junk of other people. The place we are in has 3 bedrooms and one living room, so it’s technically big enough but not really, since Donn works from home. (He’s a photographer. Several people have asked me lately what he does) Right now, he’s using the desk in Ilsa’s room, which she loves of course. The doctor is considering relocating. If he does, we will try to rent it ourselves. (If not, we can be here till Feb and we keep looking) We need to feel settled; we need to own more household items than two towels and an ambiguous espresso machine. It’s very odd to be an adult human and not have keys. When I got my set to this place, I went ahead and put them on my own key ring, just to feel a bit more ownership. This week is Thanksgiving. I know this from reading blogs. (See? Not a waste of time after all!) The kids have school till 5 that day. The oven is tiny and funky and tends to run very very hot, but I’m thinking of inviting the Korean family and the English family over and serving the whole spread; turkey, mashed potatoes, pumpkin pie made from scratch, and all. I haven’t decided yet. It would be a lot of work, and I couldn’t really ask them to bring anything. On the other hand, what’s Thanksgiving without lots of extra people? I know you can get turkey breast here…I think I might be able to pull this off, and at least my guests would not be comparing my sweet potatoes or Brussels sprouts to the ones their mothers used to make. The real question is: do I have the energy? Advent starts Sunday. We have no Christmas lights or music or ornaments. Ours are in boxes in a garage 1000 miles away from here. Some of the stores have decorated their windows with sparkly, nondescript ornaments, and I saw tinsel for sale at Marjane yesterday. This place could be fun to decorate, in spite of the borrowed furniture and the lack of things to call our own. I know just the spot for the tree. *today’s post title courtesy of My Junk Mail Folder, which I’ve been cleaning out. I am posting this from our new place. This place may be permanent, or as someone put it, as permanent as we ever get. Or we may be here just a few months. Either way, we’re out of the basement and unpacking those darn cases, and we are very happy about it. I’m off to catch up with google reader and IM with my sister-in-law and perhaps, just maybe, leave comments on other blogs. I have managed to read some offline and have several times wanted to leave comments, so now I have plans to go back and write them. What kind of odds would you give that of actually happening? Yeah. Of course my google reader is at 219 and that might take some time. Card update: much progress has been made. The end is in sight now, although still kind of a speck on the horizon. We are now bundling them in stacks of 5. I’ll try to take a picture before they’re gone but still have not bought batteries for my camera. Yesterday I spent a happy afternoon playing with rubber cement. I have never been neat with my hands. (Me and Jack Lewis, I tell you. We have so much in common! I was so happy when I read Surprised by Joy and learned this about him) I am a fast typist and I can play the piano if expectations are low, but that’s about it. I have learned to knit on about four separate occasions, and each time I dropped and added stitches with wild abandon, creating enormous gaping holes, eventually giving up not in despair but out of sheer boredom. I know knitting is huge right now and everyone is giving away home-made scarves for Christmas, and I’m very impressed but not envious of the work involved. Why knit? I mean it, really? The woman we’re staying with has contracted to do the cards which are sold to raise money for the local children’s hospital, the one that reaches out to the very poor who could not otherwise afford medical care. The cards are made up from the children‘s artwork. She has to make 2000 of them, and I’m amazed at how labour-intensive they are. She is a silk screen artist, and each card is made by hand, printed onto paper and then cut and glued into place. Some designs need four or five bits cut and glued onto cardstock. The results are unique and charming. Donn and I are helping. I don’t know the first thing about silk-screening, but I am safe around scissors and glue, so I‘m working on that end. It’s a bit nerve-wracking, as these are to be sold and I’m not very good at fiddly things like straight edges, but on the other hand, having a picture a teeny bit askew could be construed as appealingly child-like. I hope, anyway. The cards are gorgeous, and if I could think of a way to sell them to you that didn’t involve me having to put any effort into it, I totally would. Hmmm. Maybe this is why I never did very well at math. I cook meals for them–spaghetti, pizza, Mexican food. They exclaim over the unusual tastes. She cooks for us–Korean beef, miso soup, spicy salad with avocado and cucumber, potato pancakes dipped in soy, eaten with chopsticks. Every meal has rice, usually soup, and tea. We exclaim over the unusual tastes. She and I are both hoping to broaden our cooking repertoires. According to her, spaghetti is exotic and Korean food blasé. I have the opposite view, and I carefully watch her measure and chop, committing to memory as much as possible. The date to move out of her basement, however, has been moved yet again. Maybe Monday, now. In the meantime, my fingers are sticky with glue. The children want to help, but I’m reluctant to let them–not because of the so-called dangers of rubber cement, but because I am afraid they will mess them up. We only have 350 finished, out of 2000; there is still so much to be done! Spanish drivers are among the most courteous in the world. I’m pretty sure this is true and not just a reaction to learning to survive the chaotic Moroccan streets. In Tarifa, as soon as we got anywhere near a crosswalk, they would skid to a halt and wait until our feet were back on the pavement on the other side before moving. It was very bizarre, and it took us some time to get used to it. Cars would slow down as we stood at the crosswalk, but we didn’t dare step into the street until they had come to a complete stop and were impatiently waving at us to get on with it. Now that we are back in Rabat, we realize we’ve lost a bit of our hard-won edge. We’re not quite as quick at crossing as we were; we have reverted to expecting people to honor crosswalks at least a little bit. It’s not good. I came within inches of being hit by a car the other day. Other than that, Spain is receding rapidly into the distance, barely visible even in the rear-view mirror of the mind. It was relaxing while it lasted. But dealing with stories of workers who don’t even bother to show up for days, delaying the time I can emerge again above ground and unpack at least a few more suitcases, hasn’t done much for my mood. I suppose I should be happy I don’t have to deal with the workers myself. The original date to move out of the basement was last Friday. Then it got moved to Monday. Now it’s, maybe, next Friday. Insha’allah, as they say in these parts. In the meantime, we’re eating very well and feeling very stressed. In my dreams we are always, constantly, travelling, drinking coffee in restaurants while glancing at our watches, rising to go, surrounded by luggage. In my dreams, my feet ache. 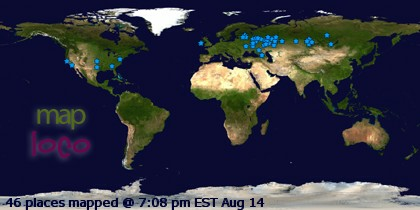 One of the things I love about living overseas is how international the world becomes. Although in this era of easy global travel and headlines from around the world we know our world in shrinking, it’s still easy in our home countries at least to surround ourselves with those that look, sound, and relate to the world just as we do. In fact, you have to work at it in order to avoid this. That is obviously impossible for Americans living in Morocco, where your taxi-driver will want to discuss the recent election and you can get onto topics ranging from abortion rights to the Iraq War to the Israeli-Palestinian tension in the time it takes to get to the store. Ilsa’s two closest friends so far are a Moroccan girl and a German girl. Elliot has a Spanish boy in his class who spent the last 5 years in New York and a Moroccan friend who just moved back here from Korea. On our way to Spain, we stopped in to see some friends who are Canadian-Korean. Ilsa spent the night in their daughter’s room. “She’s only 8, and she can already read in FOUR languages,” said Ilsa to me in hushed, admiring tones. “I’m 11 and I can only read two.” I nodded, thinking of my own monolingual childhood. We are currently living with a Korean family; Korean-Korean, as they say, as opposed to Korean-Canadian or Korean-American. English is their third language. “Tank you papa,” says their six-year-old sweetly as he pours her juice; it‘s one of her few English phrases. For lunch today, we wrapped purple rice in thin strips of salty seaweed, and crunched down tiny whole fish that were crispy, sweet and spicy all at once. They were so good that you didn’t think about the eyes and heads, just about how the sesame seeds and sugar and soy and hot peppers were mingling and dancing on your tongue. We can’t offer them money in exchange for more than doubling their family size for more than a week, we’ve learned. That would insult them, make them very angry. I imagine it being as if I invited some friends over for supper and they tried to pay me for my efforts. But it’s hard negotiating the unspoken lines between cultures. Donn was helping our hostess with some prep work she needed to do for her art (she’s an artist). “You can go and relax; I‘ll do it,” he told her. “I don’t know how to relax,” she replied, in total seriousness. In the meantime, I spend far too much of my time lying on my bed in this little room, hiding out, reading and typing, my way of staving off depression. (I also house-hunt and visit people and do laundry; I’m not actually a vegetable) She and I drink coffee together and talk; we are learning each other’s pasts. The twins have begun taek-won-do class with her husband. We’re surviving, here in the basement. We enjoy our hosts; we love their food and their gracious hospitality even as we struggle with guilt for all the extra work we are giving them. But oh, how we long for this waiting to be over, for the cases to be unpacked, for the feet to stop aching. Tuesday was a long day. 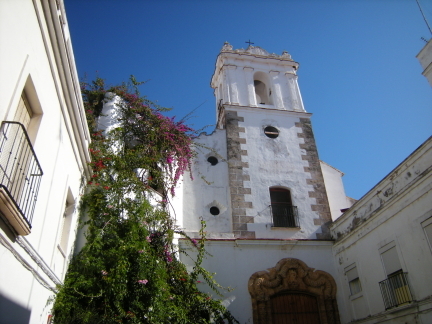 We were up at 6:30 Spanish time, which is 5:30 Moroccan time for those of you playing along at home, and I was actually up even earlier as I had one of those “wake up to pee and then stay awake worrying about things” moments, so I was actually up at 5 Spanish time, 4 Moroccan time. Yawn! I heard people heading home as I lay there, desperately trying to relax. We had quite a time finding breakfast in Tarifa at 8 a.m. Nothing is open! We eventually found a little café-bar, very much a workingman’s sort of place, which provided us strong bitter coffee and toast with jam. Our trip was uneventful if long. We caught the ferry no problem, had a good crossing, had bags of time to wait at the Tangiers train station, where we bought some delicious curry chicken flaky pastries for about $1 each. The train sat for an extra half hour in a little beachfront town called Assilah, which was mildly annoying, but we really didn’t care. We watched the waves breaking on the shore through the window. We had an entire compartment again, so we were sprawled out and relaxed. Now we’re back and vacation is over. We’re officially homeless, camped out in the basement of some amazingly generous people that we’ve known for only 2 months now. Supposedly we’ll move into our own place next week, but we have to wait for the current occupants to vacate. They are also waiting, for the work to be done on their new place, which is proceeding at exactly the rate you’d expect in a developing country with a somewhat weak work ethic. In other words, we are not exactly sure when we get to move in. So we’re in a basement, dealing with the fact that most of our suitcases are over at the new place, and Ilsa had the suffer the deep embarrassment this morning of taking her sports exam in board shorts, since we couldn’t find her sweats. I had this post ready to go a couple of days ago but my battery died before I actually got it online. I don’t really have internet access these days, until we move, so you will hear from me sporadically. My google reader is piling up. Sigh…this had to happen when everyone else is doing NoMoPoWhatever, and posting prolifically. Don’t worry if you don’t hear from me. I’m fine; stressed and grumpy and just fine. Sunday afternoon’s picnic at the beach. It was cool and very windy, alternating sun and shade. The kids had a blast making sand forts and having a full-out sand-ball fight. 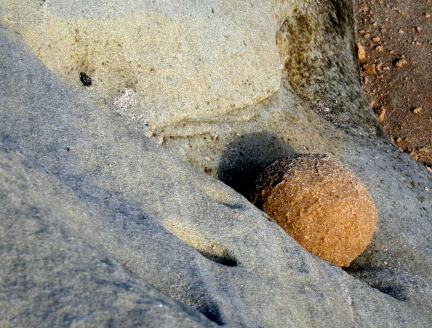 Of course my camera’s batteries had just died, so I didn’t get any pictures after this lone sandball. 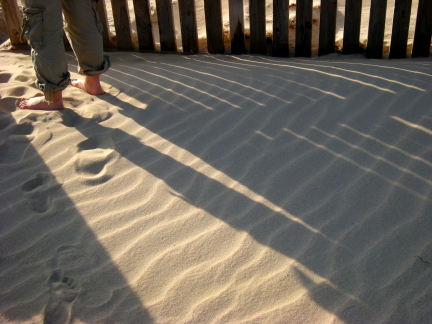 It was wonderful to feel the sand between our toes again! When we lived in Mauritania, we went every Saturday, but this was our first beach trip since we left in July 2007. 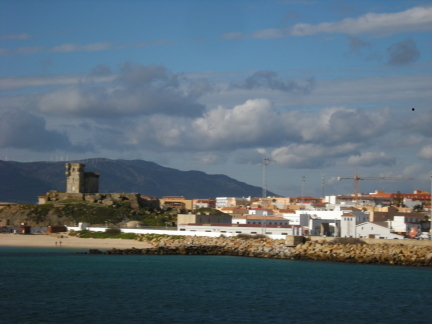 Tarifa is the “southest” point of mainland Europe. 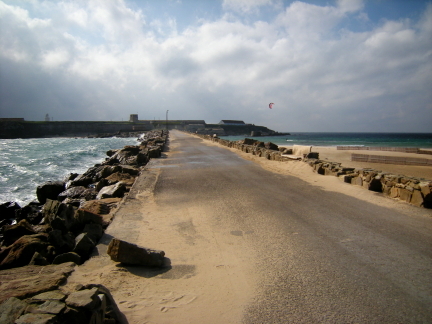 The water to the left of the causeway is the Mediterranean; to the right, the Atlantic Ocean. 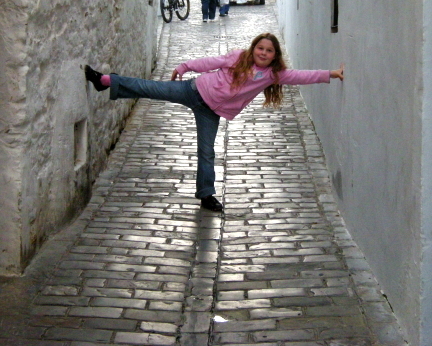 I told you the streets were narrow! 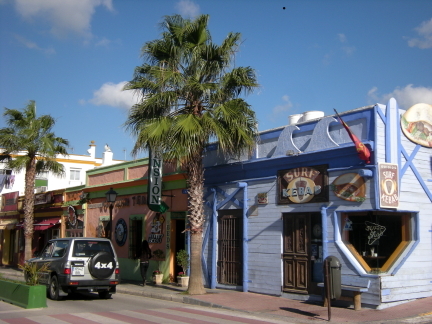 You’ve seen lots of pictures of the ancient city; here are a couple of modern-day Tarifa, along the busy main street which is lined with shops catering to wind and kite surfers. 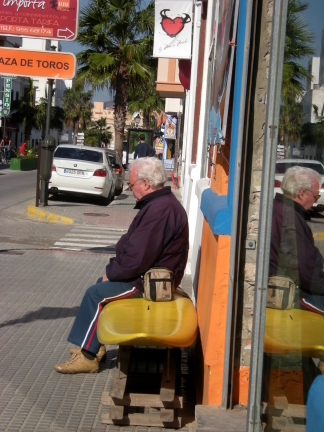 There are plenty of places for old men to sit and warm their bones in the sun, or catch up on the day‘s news. One place even had a bench made from a surfboard! 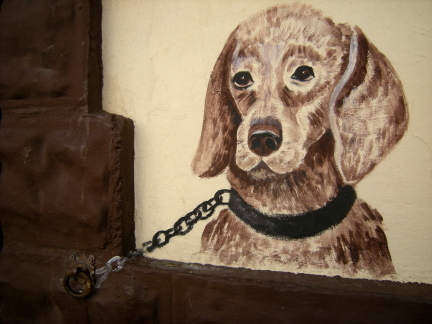 This is some wall art outside of our favorite bakery, showing where to tie up your dog since he wasn’t allowed in. 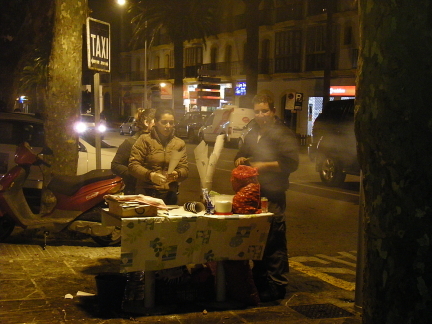 Every evening, these people roasted and sold chestnuts. They are delicious and warm your hands as well as your stomach. They saw me take their picture and were laughing, thinking it wouldn’t turn out. I showed it to them and they said, “Muy Bueno!” We walked away with a bag of warm, freshly roasted nuts. The place where we’re staying has a lemon tree just as you walk in. Several times now, we’ve been served lemonade made from freshly-squeezed lemons. It’s delicious. On Friday, we decided to head to Gibraltar. We got off to a very late start, and the bus schedule we’d been given seemed to be suggestive as opposed to authoritative. The helpful man in the tourist office had said a bus left for Algeciras every half hour, so we headed off to the bus station somewhat optimistically about 11:30. According to the schedule, there was a bus at 11 and another at 12:30, but we only waited 15 minutes and caught one at 11:45. We had followed his advice and bought a card at the tobacconists. It cost 1.50 euros and we were told that this was a deposit. We put 20 euros on the card. Each ticket would normally cost 2 euros, but with the card we received a discount so that 5 tickets cost 6 euros. We had to change buses in Algeciras, and the tickets for the second leg of the journey were the same price, so overall the card worked out really well. You have to put money on the card at a bus station or tobacconists, and then you use it to buy tickets as you’re boarding a bus. The bus wound through the rocky hills of Southern Spain. It was a hazy morning with high thin clouds, and the Mediterranean sparkling below–a green and silver morning. We passed groves of eucalyptus, olive, and lemon trees and lines of windmills turning lazily. Algeciras is a good sized town and that’s about all I can tell you about it, since I only saw bits of it from the bus. We changed buses at the station and then were off to Gibraltar, the giant rock of which is easily visible along most of the route. The bus goes to La Linea de la Concepción on the border, and it’s quite a short walk to passport control. The crossing goes across a live runway, and on the way back we had to wait for an EasyJet to roar past in landing before walking across ourselves. We really weren’t sure what all to do. There’s the taxi-driven guided tour of all the main sights, but that cost $150 for our family–a bit beyond budget! We hadn’t really researched it. We just sort of wandered in the direction of the city center, and found ourselves crossing the LandPort (I think that was the name–why didn‘t I take notes? 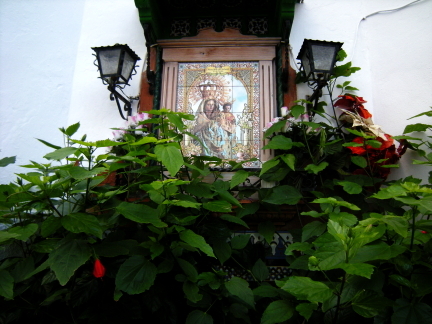 ), which for centuries was the only way to walk onto Gibraltar, through a short rocky tunnel. 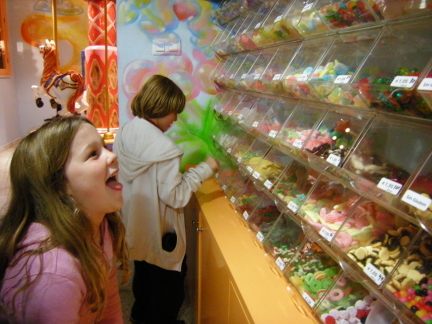 It comes out into a large square called Casements, which is lined with shops and galleries and is filled with tables and chairs corresponding to various establishments (including, to our children’s delight, a Burger King. No we didn’t eat there!) We settled ourselves there, enjoying the alternating sun and shade, and enjoyed some proper British fish and chips with malt vinegar. That’s the Rock itself just behind. Sorry for the poor quality snap. Afterwards, we just wandered through the main shopping area. We have since talked to others and found out all that we missed, but honestly I was wearing entirely the wrong sort of shoes to hike that giant rock, the sight of the first Moorish invasion onto mainland Europe. We missed the monkeys. The museum wouldn’t take our euros or our credit card. 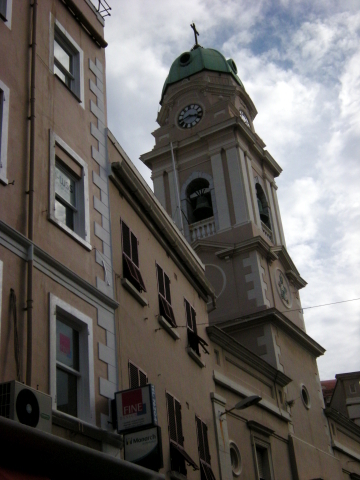 So we mostly wandered in and out of shops and churches. Since our biggest goal was buying lots of British foods, the day was a success, but I’d like to go back sometime to get more food and also to do this tiny territory properly. What did we buy? Marmite, HP sauce, Branston pickle, Turkish Delight, Crunchie bars and Cadbury’s Fruit and Nut (the real kind, not the American wax-chocolate version), Dolly Mix and Demerara sugar, Patak’s curry paste and Illy coffee (which is French but oh well! It‘s delicious). In Marks and Spencers we bought tea bags and bakewell tarts and, of all things, cranberry sauce–made from real American cranberries! I was thrilled. My biggest disappointment was not finding a bookstore, but honestly we missed the majority of the city. Next time. We staggered back with fingers aching from the weight of plastic bags cutting into them and waited for the bus back to Algeciras. We ended up having to spend an hour and a half in the Algeciras bus station, freezing, because we’d assumed that we’d be able to catch one of those elusive every half hour buses, although I feel that they are urban myths. I actually took my boots off on the bus. My only pair of boots were bought in Morocco, and they have leather soles–that is, only a thin piece of leather makes up the sole. There is no padding, no rubber grip, nothing to cushion the foot from feeling every little rock in the pavement. On top of that, these boots have three-inch heels. Yes they are really cute, but they are not ideal walking shoes, and I’m rather proud that I have walked so extensively in them. 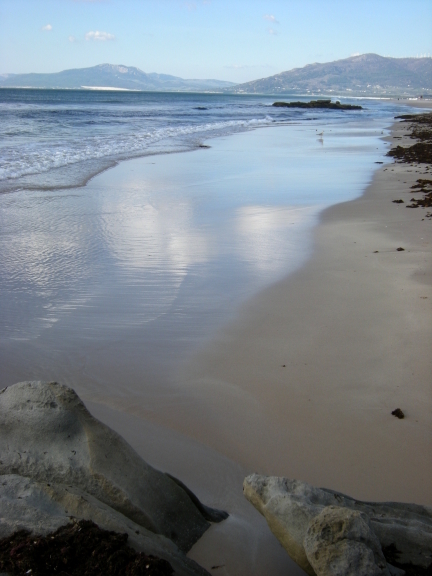 Once back in Tarifa, we deposited all our goodies and headed out to find dinner. By this time it was about 10 p.m. and we were hungry. 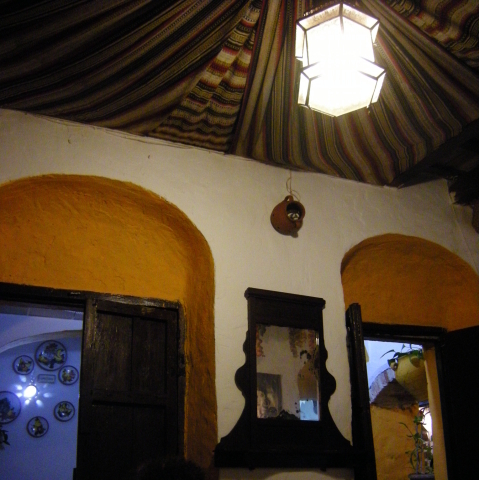 We ended up ordering several different tapas and sharing them in a warm, charming restaurant. We got another free concert as well. 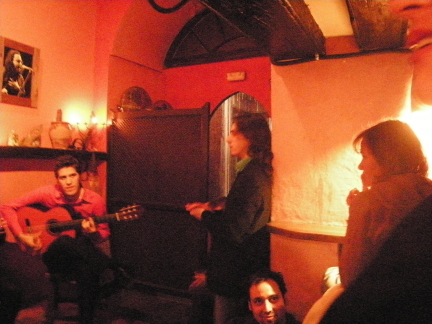 In the apartment above the restaurant, a group was practicing. As people entered the square below, they would shout encouragement and join in the singing, so we were surrounded by music. That evening, we headed out for supper about 8. We went back to the same little Tex-Mex place we’d eaten at the first night, as Elliot had ordered nachos con chile con carne that were so good Donn and I wanted our own. We arrived about 8:15. The door was open and tables and chairs set up, but the light wasn’t on yet. Were they open? Donn asked, and the guy looked at the clock and shrugged. Yes, it was about time to open up, although we were obviously early. We sat down anyway, and he turned on the outside lights, brought out a warmer, and hung up a mask over the door, part of the décor. 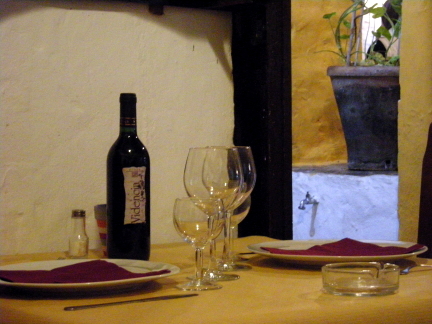 Welcome to Spain, where lunch time is 3 and supper is between 9 and 10. Apparently when we went out to eat at 7:30 the other night, we were getting in on the end of snack time. (We don’t have an equivalent in America; goûter in France and teatime in England. I did learn the Spanish word but I don’t remember it). That night, Donn and I went out for dessert, and we discovered that many places we’d assumed were closed for the season are actually still open–at 11 p.m. that is. We found crepe restaurants and little stands selling Belgian waffles covered with chocolate doing a roaring trade. When in Spain, I told Donn, as I tucked into something called an Argentinian pastry, served with ice-cream. We decided to spend our first full day in Spain just hanging around Tarifa. This was a good decision, since we like medieval coastal towns full of little shops and cobblestone alleys and cafes and plazas with trees full of ripening tangerines. We slept in rather late, and decided to visit a pastry shop we’d seen the previous day. The kids had hot chocolate and pain au chocolat–really good ones with chocolate all over the inside and chocolate shavings outside, rather than just one stingy little bit in the middle. Donn and I had espresso (café solo) and ham and cheese croissants. All was delicious. Afterwards, we set off to see the town. We stopped for lunch near the biggest church, and sat outside enjoying the mild weather. Spain is noticeably warmer than Morocco, although I realize that perhaps this week is warm in Morocco as well. Menus here are a bit of a guessing game, since none of us speak Spanish. (Yes I know the twins studied it last year, but we didn’t get much beyond colours and numbers.) But we‘re really expanding our vocabularies. Octopus is pulpo, for example, and it’s coming in handy to know that. Some of the menus have English translations. One announced “incoming” for starters, and another announced the “home salad” was “dressed.” Another said, “Thank you for their visit.” No, really, thank you. After filling our stomachs with patatas tortillas (potato omelette; I know, I was expecting tortillas too), we headed back down to the port. There are advantages and disadvantages to coming off season like this. Advantages are obvious–cheaper rates, no crowds or waiting for things. But there are disadvantages as well. The castle is closed for repairs, several stores are either closed for the season or out of business, and it’s a bit cool for the beaches. 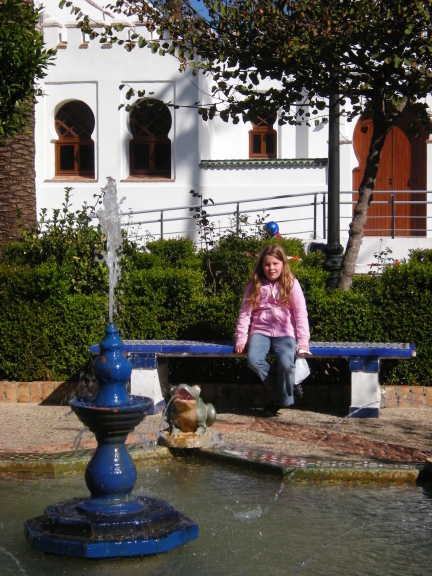 We walked past the castle down another little alley, followed a staircase, and found ourselves in a courtyard with a froggy fountain. We snapped photos and rested on benches, before heading down to the port. We found our way down to the beach, and then made our way back to the hotel. 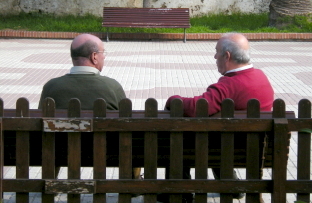 After all, if the Spanish take a siesta every day, we should too. When in Rome. Refreshed, we headed out again about 5 to enjoy the late afternoon light. 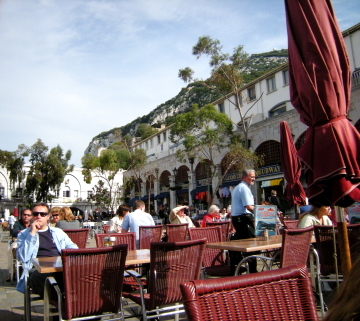 This time we ended up enjoying a coffee at an outdoor café, and then stopped by the tourist office to ask about buses to Gibraltar. The man working there was really kind and helpful (and if you are thinking, well of course he was, that means you have not visited many tourist offices) He explained that if we bought a “tarjeta de transporte para via jar con autobuses comes” at the local tobacconists, we would save substantially on 5 tickets. He also pronounced Algeciras properly for us. We’d been saying, well, Algeciras, but of course in Spanish it is Al-ha-theer-us. Don’t forget the lisp! As the lady at the bakery said, “Es diffithile!” She emphasized it for us again, “Diff. I. Thile!” We smiled and nodded. It’s what we do. He wrote out what we would need to ask for on the back of a bit of paper. Later, back at our hotel room, I examined it and realized it was an ad for a free flamenco concert, that night. The kids wanted pizza so we humoured them and went to “Punta Pizza,” run by a friendly woman. Her husband spoke French so came over to translate for us when we had questions, and he also was apparently the delivery person, but he spent a lot of his time keeping their one-year-old fed and happy, while the mother cooked delicious pizza, pesto, and an appetizer consisting of grilled apple and local cheese and walnuts all drizzled with honey. 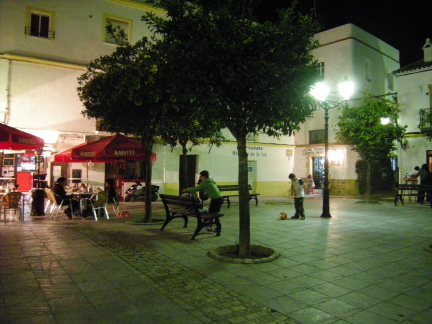 We settled the kids in bed and headed out for the concert, which didn’t start till 11 p.m. We’re Spaniards now, we thought proudly, not at all tired thanks to drinking espresso at a sidewalk café at 6 p.m.
We knew where the café was–right near the froggy fountain–so we headed directly there. I was proud of myself for already being able to figure out a shortcut. The place was crowded and smoky but we found the last two empty stools and settled ourselves in. We were delighted to realize, when the concert started, that we had inadvertently gotten ourselves into the front row. We really had no idea what to expect. I was sort of hoping for flouncy skirts and lots of hand gestures. I imagined it being sort of happy dance music. Instead, two people, a woman and man, came out and sat on two low stools. 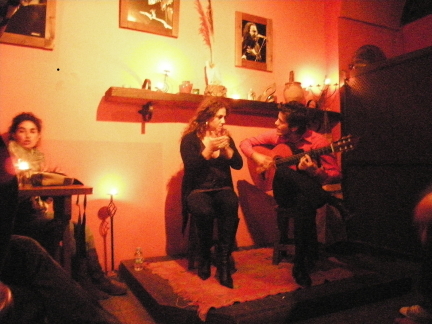 The man tuned his guitar, the woman took a deep breath. “Maria!” shouted several in the crowd. Maria Montilla had an incredible voice. She scrunched up her entire face and brought out an enormous volume from deep within. Her voice ranged all over, wailing over the scales, followed by the guitar. She rarely smiled; it is solemn, serious music, no doubt about life‘s struggles, and death. There was nothing left to do but shout Olé! 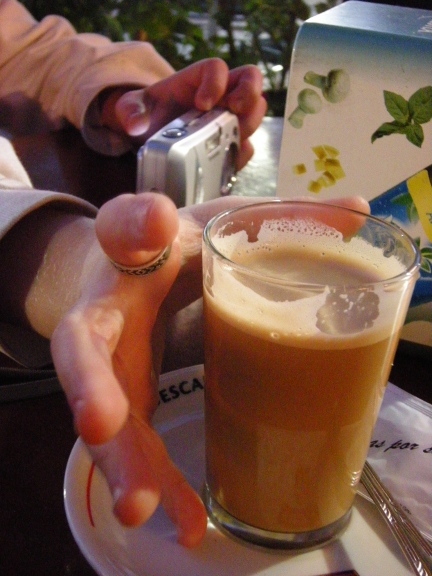 She kept time by clapping softly, and everyone in the café followed suit. There was one young man in particular, standing nearby, who stomped his feet and clapped loudly; this got him big smiles of recognition from Maria, perhaps acknowledging someone who also loved this music. 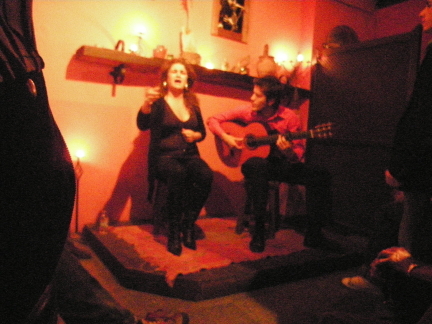 Also, a woman sitting near the singers twirled her arms in intricate patterns and gestures. But mostly it was just the music and the hot crowded room and the smoke-filled air, people clapping and yelling “Olé!” and stamping their feet in time. We left during the break because it was after midnight. I was amazed at the power of Maria’s voice, which hadn’t faltered once during an hour of singing, and who apparently was only half-way through. It was a great concert. Tuesday, we spent the morning finishing up and getting out of our apartment. I spent most of my time trying to steam dry our laundry in front of the space heater. Three days of torrential rain meant that everything was still really damp, and I wasn’t looking forward to dealing with clothes mouldering in suitcases. 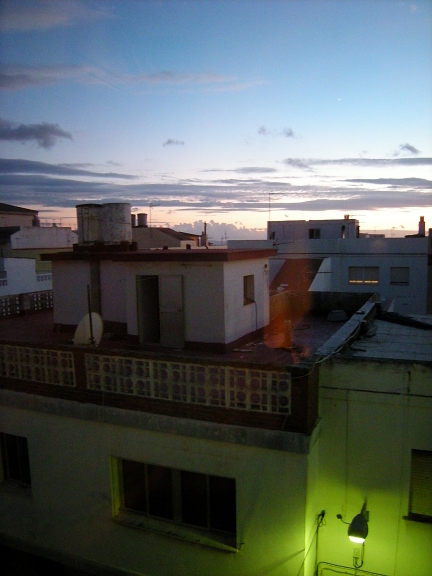 We left Rabat about 1 p.m. and went as far as Kenitra that first night, where we stayed with friends. Yesterday morning, we caught the train at 8:17 a.m. and headed north to Tangiers. The day alternated between cold, gray skies and scudding rain, and brilliant sunshine and steaming sidewalks. We drove through the Moroccan countryside, full of green rolling hills, orchards of ripening oranges, and small ragged herds of sheep or cows usually followed by a shepherd and often a sheepdog. One shepherd had brought his herd to a green meadow, where he’d set up a plastic lawn chair and was relaxing in style. Children waved as we roared past. We had opted for a first-class compartment and after a short while, had it to ourselves. We got into Tangiers about 1 and made our way out of the tiled train station onto the street, where we bargained with a “grande taxi” to take all of us to the port. Elliot scoured the Tangiers skyline in hope of recognizing a landmark from “The Bourne Ultimatum.“ We sorted through the chaos of wannabe porters and guides and bought tickets on the fast ferry to Tarifa. In an amazingly short time (compared to our last experience with this port, which I will tell you about some other time), we had boarded an enormous ferry and found seats. The crossing only takes 35 minutes. You can see Spain in the distance as you head out. The twins had a blast running about on deck, dancing with excitement as we watched the plume of spray obscure our view of the house-covered hills of Tangiers. Soon we were docking. 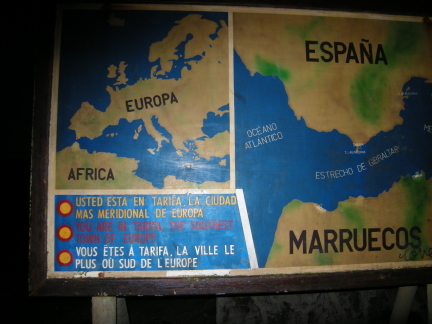 We wandered out of the port, dragging our cases, and found a map of Tarifa posted outside a tourist information area. Our hotel was close, so we walked up cobbled streets and through narrow, hilly alleys to find it. 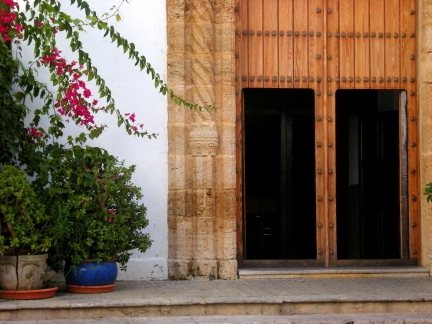 Tarifa is small and charming. 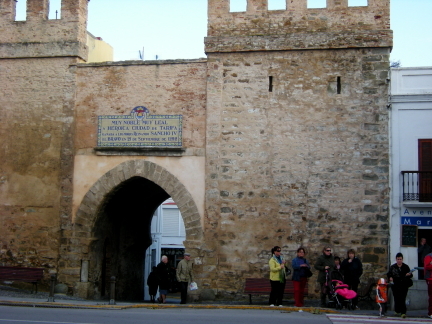 After checking in, we made our way to the ancient city, entering through a stone archway to an area of alleyways and plazas and churches and shrines. We walked around, getting an idea of the plan of the city. We were late for lunch (Spain is an hour later than Morocco, so by this time it was 5:30 or so) but early for dinner, so we bought rolls and pretzels at an artisan bakery and munched them as we wandered a more modern area, filled with surf shops and jewellery stores. 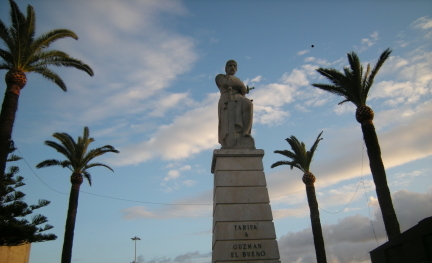 This statue is located on the edge of the old city, just across from the port. 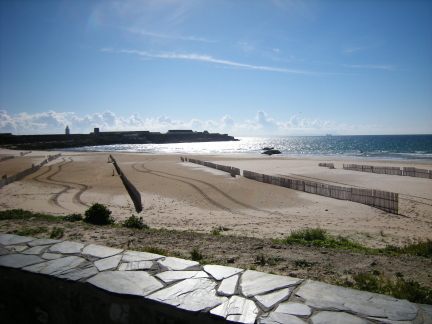 Tarifa is on the southernmost tip of Spain. The blue sparkling water on the west is the Atlantic, on the east the Mediterranean, and the mountains of Morocco are easily visible across the Straits of Gibraltar. It’s known as the Wind Capital of Spain, and the green hills just beyond town are full of windmills. It also has miles of gorgeous sandy beaches, and when the ferry was coming in, we saw lots of multi-coloured kite surfers. A few hours later, we ventured out again in search of supper. 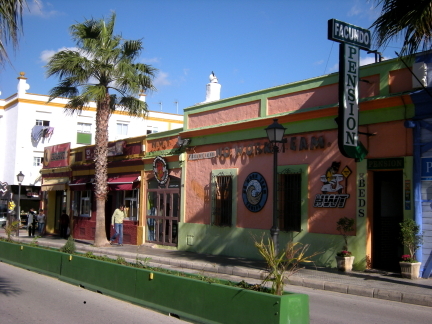 We found a place advertising “Tex-Mex” and tapas, in a square in the old town where children rode bikes and kicked a football in the night. After some great food, we walked around some more, then headed back up to our hotel for the night. 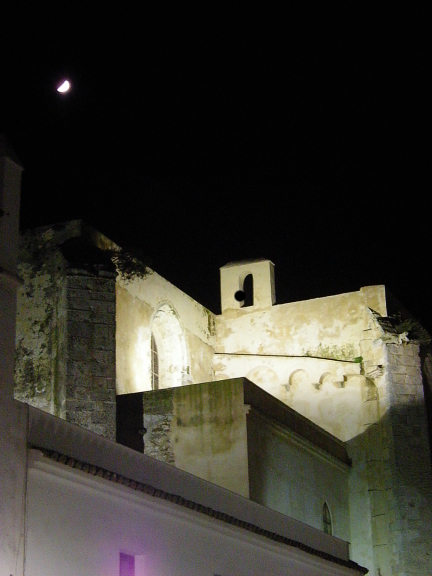 Back side of cathedral (or possibly just large church) with the moon. What can you do when you’ve found another temporary location but it’s not available for a week and a half? Go to Spain of course! We are catching a train and hoping that the rain in Spain will stay on the plain, since we are going to be in the very south. Our hopes are slim, as according to weather.com, it’s supposed to rain till Friday or so. 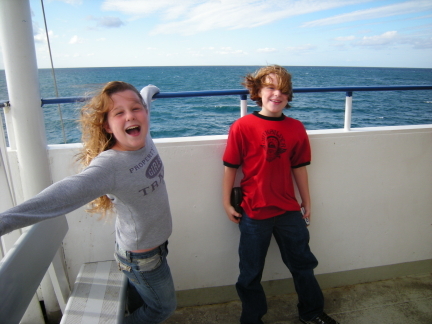 We’ll take the ferry across the Straits of Gibraltar and land in southern Spain. We have several things planned, including a day in Gibraltar, where I’m going to buy Marmite and HP sauce and mince pies for Christmas. 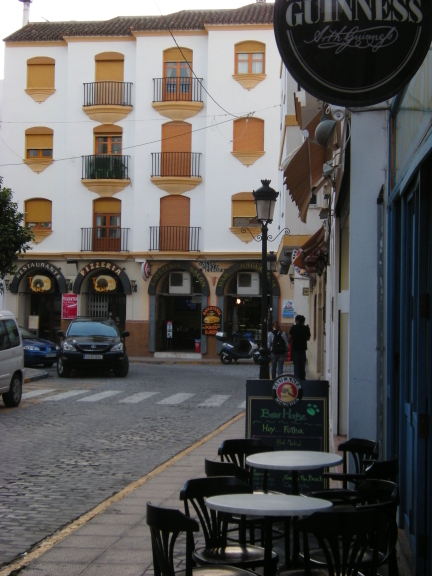 We’re hoping to take the bus to Malaga and visit the Picasso Museum. I will attempt to blog from Spain so that you can live vicariously through me, but I have no idea if I’ll have internet access or not. Stay tuned. And thank you for your prayers and well wishes. (My favourite comment? Lib said, “Stressed spelled backward is desserts. Look no further for justification.” Well, ok then.) Please keep them up–we still haven’t found a permanent place. The bright spot of my day was receiving a Perfect Post award from All Rileyed Up. Thanks, Riley! She awarded me a really cool drawing by her daughter as well. Consider it posted on my virtual fridge.